I enjoy Easter time very much, almost as much as Christmas. In all honestly, the time of year is as hectic as Christmas. We have three birthdays in the family within 7 days of Easter. Then Bulldozer and Princess' food allergies make it so Easter baskets and eggs are full of toys, not candy. The only difference is that unlike Santa, whom they absolutely adore, my kids are petrified of the Easter Bunny. They request that he not come to our house, but instead that Mommy and Daddy fill their Easter baskets. I consider myself one lucky mother in that regard. Since they are afraid of the Easter bunny, we tend to take the focus off of that character and read stories about other bunnies like Peter Rabbit and Runaway Bunny. Many of our learning time activities focused around one of these two bunnies. We've had Easter activities on our shelves for two weeks. I've put the activities in order by subject. However, we spent one week focusing on the story of the Runaway Bunny and the second week on The Tale of Peter Rabbit & The Tale of Benjamin Button. Hopefully the post isn't too confusing. Bulldozer has decided he likes writing, or tracing I should say, so I'm trying to incorporate at least one activity a week that is just tracing letters or numbers. He's doing such a great job! This activity went along with the story, The Tale of Peter Rabbit. There are many tools and garden references in the story, so I figured it was quite appropriate. Source: I found these at Homeschool Creations. Princess LOVED this activity and used it every day! I'm not sure what she enjoyed so much about it, but by day three, she could do it perfectly with no help! Each of the egg contents was separated out by what letter the object word ended with. Source: I was inspired by an idea I saw at Pre K Pages. These words were great to have around as we focused on the story of The Runaway Bunny. I probably would have used more of the packet of printables than I did, however my kiddos have mastered most of them. Source: I found this printable as part of a packet at Homeschool Creations. This was a FABULOUS activity! I LOVED it! The kids were asked to put in sequence, all of the things the little bunny was going to become, in order from 1st to 8th. I loved how the activity included not just the written numbers, but the spellings of each number too. I included the book on the tray, so they could look the answers up if they couldn't remember them. To my surprise, Dinomite had the order memorized by the second reading of the book. This was another activity Princess practiced every day. I'm not sure she gets the concept of reading words, but she loved spelling words out. Dinomite did this activity once. I was pleased to learn that he knew all of his sight words but 5 in the activity. Source: I found this idea at Pre K Pages. In need of another math activity, and wanting to give Dinomite a little more practice with his addition facts, I switched out beads and pipe cleaners for beautiful pink and purple flowered beads I found at the dollar store in town. The kiddos do great putting a bead on the inside number, and then counting out the same number of the same color bead below, then selecting an outside number and counting out those beads with the second color to find the answer to the problem. Princess is now trying to write the math problems all by herself! Source: I found the addition wheel printables at Montessori for Everyone. A couple weeks ago we worked on odd and even numbers. Dinomite really liked it, but didn't quite have it all down, so I figured we'd reintroduce them. If Bulldozer and Princess don't want to find out if the numbers are odd or even, by pairing up the counting seeds, then they can just put the cards in order from 1-20. This activity was loved by all, including Mommy and Daddy. Each kiddo did it every day last week. They loved sorting out the jelly beans (although our package came with no blue), and then did a fabulous job graphing them. I'm not sure if the little ones realized what they were doing, but they could do the activity independently with no problems. Source: I found these printables at Empowering Little Learners. 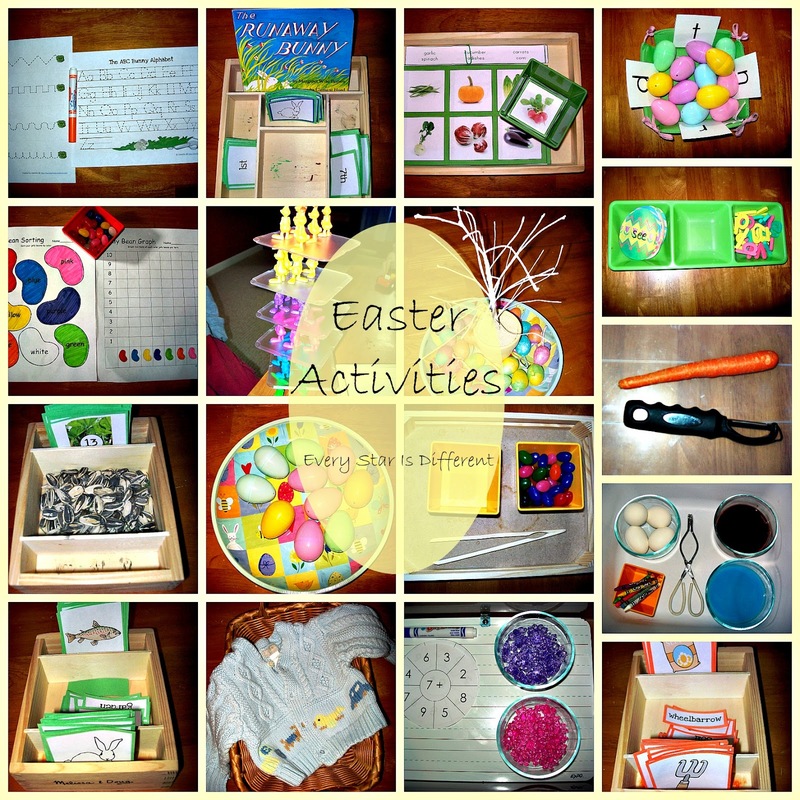 This activity went along with our Peter Rabbit theme. I've gotta say, there were some vegetables I didn't know from these cards. I was very thankful for the written guide as I was teaching the kids. Dinomite loved this activity! Source: I found this game at The Helpful Garden. Now that Bulldozer has grown out of his egg allergy, I decided to have them decorate eggs for the first time. However, I knew that the odor of the vinegar was going to really bother them, so we used Kool-aide instead. The colors varied throughout the week. I loved adding the tongs into the activity to help them with their scissor skills. Remembering that crayons could add some extra fun, I threw them in too. The kiddos are having a blast! Source: I found the Kool-aid recipe and directions at Hey! Jen Renee. This is a repeat of an activity we did last year, which I'm sure is an idea on many internet sites, but I did think if it myself. There are five pairs of eggs with different seeds in them. The kiddos shake the eggs to find the matching pairs. Once they think they've found a match, they can open up the eggs and see. Be careful to only fill the eggs up a little bit, so when the kiddos open them, the seeds don't fly everywhere. I thought of this activity myself, although I'm sure many have thought of it before me. I was a little worried about the sharp edge of the peeler, until Bulldozer selected the activity first thing and did FABULOUS with it! I was super excited, as I now know my kids can help peel carrots and other vegetables in the kitchen! When I saw this activity I knew Bulldozer and Dinomite would love it, and they did. The first day brought tears from Bulldozer, but then after practicing he eventually built the entire tower. That kid is so determined! Dinomite built the entire tower too.. Source: I found this idea at Strong Start. I found the game at our local Wegman's. I purchased this Easter tree a couple of months ago, when I saw it at our local dollar store. I thought it would be a perfect practical life activity. The kids really struggled at Christmas time to hang ornaments on the tree. This would give them great practice and really encourage them to use their pincher grasp. The activity was a huge it! We started out using tongs at the beginning of the week, but switched to spooning after Bulldozer broke the tongs by accident. They are getting really good at these type of activities. It's going to be time to move on to something else soon. Source: I found this idea at Carrots Are Orange. And there you have it! We've had a lot of fun preparing for the Easter holiday!